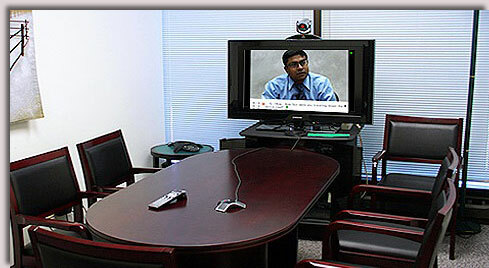 Chicago Videoconferencing at our Loop office or your location. 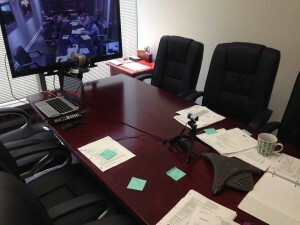 High definition Chicago videoconferencing for depositions, meetings, and more. 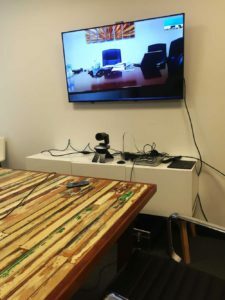 Lake Cook Reporting supports high definition Chicago videoconferencing for depositions at our Chicago Loop location with bridging to room systems, PCs, Macs, tablets, and phones. At our north suburban Bannockburn, IL location, we have four conference rooms with videoconference capability. We have three small rooms for one to four people, and one large boardroom-style table capable of seating up to 10 participants. Our business also features portable video conferencing solutions, which allows high definition videoconferencing in any location with internet or cellular phone service. 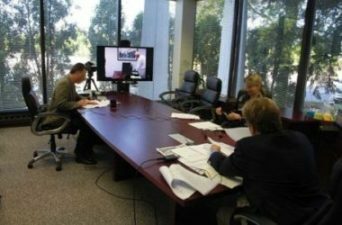 We specialize in pairing our existing legal support services like court reporting and legal videography with video conferencing. Our high quality audio allows our reporters to take down complex legal and medical jargon during video conference depositions without worrying about interference that comes from speakerphones or lower quality videoconferencing. Our legal videographers also record direct line-in audio from the video conferencing units, which ensures the highest quality audio possible on the video recording. Ask questions or schedule services with Lake Cook Reporting in Chicago today. Schedule point to point conferences, or bridge multiple sites. View our network of video conference sites at MIVNET. Connect with a location of your choosing, or let us find one for you. Extra locations and bridging provided at an additional fee. Connect to Polycom, Lifesize, Cisco Tandberg, and other devices. We handle setup, testing, etc. so you can focus on your case. Video conference to PCs, Macs, and tablets. Our cost-efficient bridging software lets you connect our room systems to a variety of devices. Available as free software via Zoom for PC, Mac, iPads, and Android tablets. Phone bridging also available for non-video participants. Our system is 100 percent portable, allowing set up at offices, medical facilities, court, or elsewhere. Fully compatible with traditional video conferencing systems. Call our videoconference systems from your personal device. Cost-efficient bridging for multiple sites. Connect several video conference sites, several computers/tablets, or phone participants at a low cost. 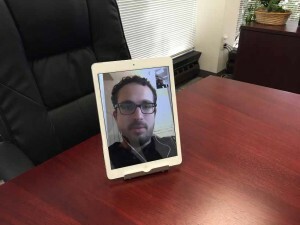 Example portable video conferencing on a cellular-enabled iPad. Portable video conferencing interfaces with many devices, including video conference room systems, personal computers, tablets, and more. Share content from your personal device. Connect your PC, Mac, phone, or tablet and share content remotely. HDMI, VGA, and Mini Displayport connectors available, allowing for just about any device to connect and share content. Adapters for iPads/iPhones available for wired connections. Use AirPlay to connect your iPad, Mac, or iPhone to our video conference systems without plugging in any cords. Software-based sharing also available for PCs. Display paper documents with our document camera. Our document camera connects to your PC/Mac, or connect to our devices. Affordable portable Chicago videoconferencing in the area. One flat fee, no WiFi internet required. Lake Cook Reporting has several portable video conference units that run on the cellular LTE network, which allows us to deploy them just about anywhere with cell phone reception. Our reporters can set up a laptop or tablet equipped with software that easily connects other computers, tablets, video conference room systems, and more at the click of a button. Best of all? 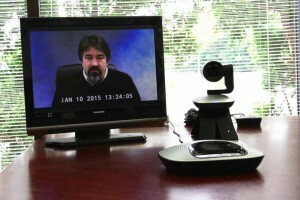 Our clients pay one low flat fee, saving you money when compared to traditional video conference deposition calls. Our portable videoconferencing unit can be used with any PC, laptop, Mac, etc. with a USB port. The computer can then be plugged into any size display to show a picture. Testimonials and Reviews of Chicago videoconferencing by our clients. Always flexible, convenient and fast to provide copy, They coordinated video depositions with witnesses here and in Florida at the same time without a hitch.